In many projects a lot of custom business logic can be written in .NET languages like C#, VB.NET or F#. While trying to implement custom Java Applet that will be easily hosted in the users browsers, enabling to reuse that logic within those applications by running them locally on target machines with native performance might prove useful. Additionally, the possibility of using C# in Java applets provides us with unlimited access to all the existing and third-party .NET frameworks and components that can be utilized in the Java-based applet project. Reusing the .NET code in Java Applet might be beneficial because of significant cost and time savings in any project. Starting with Javonet 1.3, it is possible to host and use Javonet within Java Applet through Web Browser. Developer should create Java Applet code as a JAR file. All custom .NET DLLs to be used (those that are not included in .NET Framework) should be included within that Java applet JAR archive. Web page with Java Applet tag should be created. Java Applet tag should firstly specify main class from Java Applet jar file in the “CODE” attribute and, secondly, comma separated Java Applet JAR file, Javonet JAR file and all other dependent JAR files (if needed) in the “ARCHIVE” attribute. While the user enters the Java Applet Page, the browser will load Applet by calling main class from Java Applet JAR file. Applet should extract custom DLLs and save them in a temporary directory on one’s Hard Drive. Subsequently, the Applet should set new temporary directory as a current directory in java user.dir property and then activate Javonet. Javonet will save the license file to the temporary directory and will be set to work. Java Applet main class should add references to custom .NET dlls stored in user’s temp directory and perform any operations needed. Javonet will have full access to user’s local .NET framework and custom DLLs from temporary directory. Optional: instead of temporary directory in enterprise environment, developer can consider using any fixed dedicated directory like “c:\appletTools\”. 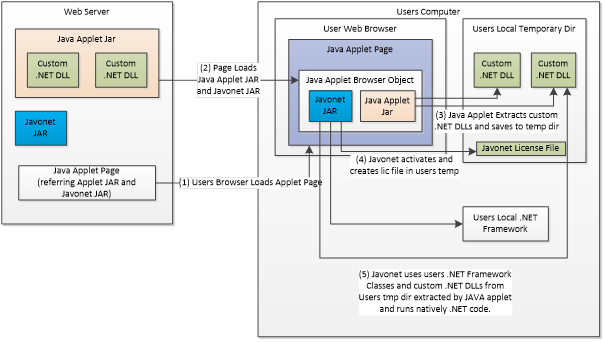 Javonet license must allow for multiple activations equal to expected amount of users accessing the Java Applet. (it is possible for a developer to test on FREE or developer’s license on his own machine, but running the code from another machine will require multiple activations – this can be requested while placing order for commercial Javonet license). This sample project consists of all the items required to build and run the solution. The sample is exported as a Eclipse project, however it can be used in any other IDE or, alternatively, get compiled from the command line. projectBuilder.xml the ANT file for automating the project build process. In “JavonetAppletMain” class you will find three methods and a constructor. The constructor is responsible for initializing and activating Javonet, as well as extracting custom .NET DLLs and adding them as reference in Javonet. The helper method “extractDotNetLib” provides the functionality required to extract custom .NET DLLs from applet JAR archive and place them in temporary directory, so that .NET framework can load those DLLs during execution. Another helper method called “setCurrentDirectory” replaces the default user.dir property value. It changes the value from default path, pointing to user’s desktop, to the local temporary folder path. The Javonet license and custom .NET DLLs will be stored in that folder during the execution of an applet. The main part of the project is located in “init()” method, and is invoked once the applet has been initialized and loaded in the browser. In this method we create three sample labels; then, using the Timer class, we schedule the execution of our logic, which uses .NET code through Javonet. In each execution of a timer we load, .NET “Random” class generates the random integer and then uses our custom class from custom .NET DLL Javonet.ValueTypesSample.dll in order to add the sample random integer to 5. The result of these operations is presented in the labels content in the browser. The methods and objects used in the sample only begin to scratch the surface of possibilities that will be within your reach, if you use anything written in .NET within your Java applets. To build the sample project you can rely on the prepared self-signed certificate and ANT build script. The solution can be compiled by running the ANT script, which will automate the compilation of the project, creation of the JAR file, packing custom .NET DLLs into that JAR archive and signing both the applet and Javonet JARs. Before building the solution make sure that you have downloaded the latest Javonet library from our Download section, and that you have replaced the email and license key in the “activate” method with your own. After these steps are completed, Right Click “projectBuilder.xml” file and choose Run As > Ant Build. 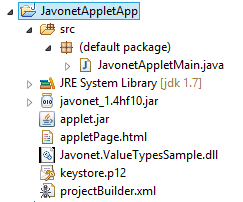 Make sure that your build is executed using the Java Runtime located in “JDK” folder. Otherwise the error of missing jarsigner might occur. To choose the target Java Runtime select “Run As” > “Ant Build…” and go to “JRE” tab. The “applet.jar” should be updated. To run the sample project just copy the “applet.jar”, “appletPage.html” and Javonet JAR files into the Web Server. If you are using the self-signed keys or keys stored in sample keystore.p12, please add those keys as trusted root certificates in your Java configuration panel. Once the certificate is trusted, open the appletPage.html in the browser.